When 11 year-old Libby moves to Woodvale in Melbourne with her parents, she is nervous about what life will be like for her now. Having left behind their farm, the Talbots are hoping to start afresh in the suburbs. When Libby meets Kit, a girl her age in the new neighbourhood, it isn't long before the two are firm friends. Fast forward to the present day when the ladies are now approaching their 40th birthdays..
Libby lives in Sydney with her husband Cam, and is a stay-home mum to their teen son Harry, whilst Kit is single and still resides in Melbourne. The two women are still close, despite the distance and the different roads they have travelled. Kit is Harry's godmother, and spends every Christmas with Libby and her family. The two women chat and email each other regularly too. When Libby finds out that Cam has been promoted and they will be making the move back to Melbourne, both Libby and Kit are thrilled with the news. But their friendship is put to the test when Libby finds herself making friends with Cam's colleague's wives, and trying to fit in with their rather posh lifestyle. 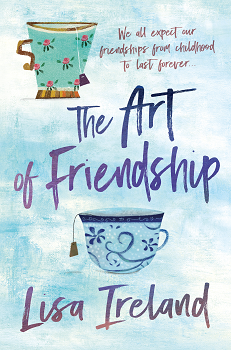 The book explores whether Libby and Kit's friendship can withstand the test of time, and explores their differences in detail. I thoroughly enjoyed this novel. I felt that the two main female characters were very real; each had their flaws and although I liked both of them, I admired Kit more as she remained true to herself and stood up for what she believed in. I felt she was more easy-going and had more integrity out of the two. I enjoyed the sections in the book that shared their younger years; I actually would've liked more, but having said that, the story did flow well and I felt that the reader is able to gain a good understanding of Libby and Kit's friendship as it developed over the years. I liked how the book ended, it actually wasn't what I was expecting, and it seemed a realistic outcome. I would gladly recommend this book as it was an enjoyable and easy read. Thanks to Beauty & Lace and Pan Macmillan for the opportunity to read and review!